All little girls look so adorable and cute when wearing THE perfect dress, and there are so many different occasions in their lives where the perfect dress is essential. For instance, being a flower girl in a wedding or even attending a wedding, taking First Communion and being baptized are all very special events in a little girl's life which require the perfect attire to make it even more special. Creating just the right ensemble for your little girl in these special moments is what Pink Princess does best. They offer a variety of beautiful dresses and outfits for your little girl, such as flower girl dresses, First Communion dresses and christening gowns. 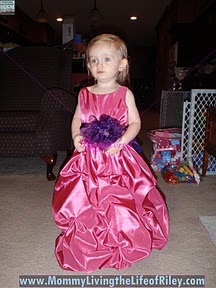 I reviewed the Fuchsia / Purple Taffeta Bubble Pick Up Dress from Pink Princess, which retails for $59.99. I think that all girls, both young and old, should have a go-to dress which is perfect for formal occasions, such as weddings, dinner parties and the like. Little girls also have several reasons with which to get gussied up and I wanted Riley to have that one special dress in her closet for just such occasions. Thankfully, Pink Princess was there with a TON of adorable dresses and outfits to choose from. I couldn't get over how beautiful their dresses looked online, yet how affordable they were. 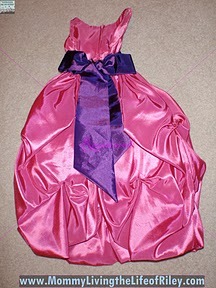 For instance, the Fuchsia / Purple Taffeta Bubble Pick Up Dress I reviewed sells for $59.99, yet I've seen many dresses of this quality and style for women which sell for several hundred dollars each! I was very excited when the dress arrived and it looked EXACTLY like the picture on the Pink Princess website! This dress was flawless and seemed to be of the highest quality. The purple accented sash and flower were so cute, and it's even removable in case you'd rather wear the dress without it. The fuchsia pick up, tea length dress looked just like several bridesmaids and wedding dresses I saw when I was out shopping for my own wedding dress. I couldn't believe how fashion forward this little dress was and I knew it would look perfect on my daughter. Pink Princess carries such a variety of dresses (over 10,000 to choose from), including kids' costumes! This is a great thing to remember when Halloween costume shopping rolls around. They have the cutest Snow White, Cinderella, etc. costumes to choose from and even perfect costumes for pageants as well. Here in the South, pageants are all the rage and so if your daughter needs the perfect ensemble for her next pageant, I highly recommend checking out Pink Princess. The adorable, top of the line dresses they sell are sure to please even the most discriminating customer and have your little girl looking prettier than a picture! Disclosure: I received the Fuchsia / Purple Taffeta Bubble Pick Up Dress from Pink Princess in order to facilitate my review. No other compensation was received. This product review is based on my own personal experiences with this item and is completely honest and objective.